This is what I like to see: people sitting in a room with one another that probably, under normal circumstances, wouldn't sit in the same room. Pharrell Williams is interviewing people on a show called Artst Tlk on a network called the Reserve Channel, which is in itself cool because it gives a people who wouldn't normally have talk/TV shows the opportunity to have a TV show. Pharrell sits with two guess each episode and they dialog about their ideas, their work, what motivated them to get started, what keeps them going, and the philosophies behind their ideals. Insight into other great people's lives is always amazing... but this is the type of amazing we need. Not just the random and/or ignorance that reality TV plays up; we also need insight into the intellectual and artistic side of people's minds as well. I like what Pharrell is doing. Check out one of the videos after the jump and enjoy. Normally I don't talk politics... cause I hate it and the online dialog about it typically causes all types of racial nastiness. I honestly think all the debates sound like those elementary debates where our peers at the time would get up on the podium in the school cafeteria and promise pizza everyday and an extra hour's worth of recess. They were willing to say ANYTHING to get the gain the people's support. Things haven't changed much since we've hit the adult world. Those same people are still promising things that they don't have the power to control in order to get a vote (evident in President Obama's Presidency more than any other I can remember; the republicans handicapped almost every move he tried to make.) A vote that only "kinda" matters sometimes (example: see the George Bush incident in 2000 when he lost the popular vote but won over the electoral college). He began to talk about the GDP of the USA and how, every time the US of A is under Republican control, GDP has gone down and how the notion of the "trickle down" economy doesn't really work. He was against having someone run the nation like a corporation. He said that owner's of corporations care most about one thing: the bottom line... and if they can find a way to only pay somebody 5 dollars a week to get a job done, they will do it. Honestly, this is nothing that we haven't heard before from any Democratic/President Obama supporter, but it was when he started talking about his own personal business that I had my thoughts stirred up. I said to myself: Self? I said: If I already had a well running, very efficient business that, somehow, began gaining substantially more profits, why would would I go hire more people? Without additional demand, what would those people do? Why would I hire people to do NOTHING? I wouldn't... I would pocket that money. I may give some to the employees currently there... maybe... since it does make business sense to keep them happy... but I'm not hiring new people just to give them money while they sit on the clock and twiddle their thumbs. Why would I?! Just to say I'm helping the jobs market?! That doesn't really make business sense to me; not when I would get the same effect donating to the charity of my choice. At least that way I would have yet another tax write off at the end of the year. (sidenote: I'm not that cold-hearted. I'm just trying to think logically like I think a corporation would think.) Thinking as a corporation, there is just no way that I would just GIVE money to people to do absolutely nothing since I don't have any work for them to do. And I know what you're thinking... "if you gave them a job, they would have money and more demand would be there." This is true. BUT it is also dependent on EVERY corporation operating the same way. Meaning... you have to get the likes of Donald Trump to stop telling people that they're fired and tell him he is going to have to hire people that he has no use for whatsoever. There would have to be a significant amount of businesses operating the same way and giving people jobs for any amount of new demand to even be significant enough to matter. Here's the truth as far as my eyes can see: People with lower income are the spenders; this is majority of your consumer base. Higher income people are the investors and savers. At the end of the day we need BOTH the rich investors and the lower income consumers to have at least SOME sort of income. Investors are needed to keep new businesses afloat... but without the consumers there would be no need for the new businesses at all. In my opinion, gasoline prices caused the issues. $300 a month in gas became like another big ticket purchase that many couldn't afford since they were already living check to check. It was gas that made food prices go up and once the food prices went up, the rest was history. "Broke" people had decisions to make: Buy this new TV/pair of shoes/house/car... or eat. If they cure the prices of stuff we must consume (gas, bread, eggs, milk, etc.) so that they are no longer ridiculous, people will have more money to blow on stupid stuff. Consumers go up, demand goes up. Demand goes up, new hires go up. New hires go up, consumers go up. It's the circle of economic life. And so we have something to cheer for.... Introducing LUV - starring Common. LUV might actually be love worthy. The trailer seems like it could shape up to be one of those memorable films in the black community. Let's just hope the character development is good and the plot of story isn't too simple (I'd honestly like to see more depth in the characters and stories of more black films... Maybe that's just me though). At any rate... The homeboy hipped me to this and I thought it would be good for the people of 713street to see... So I posted it. Watch below and enjoy. Hey man... Microsoft might be onto something with this "Smartglass" app... I think this is something that I would really enjoy having on my phone and tablet (whenever I get one). It basically connects phones, tablets and Xbox 360s like one seamless device. See the video below to see how it operates. You can visit the official Smartglass web page for even more details by clicking here. 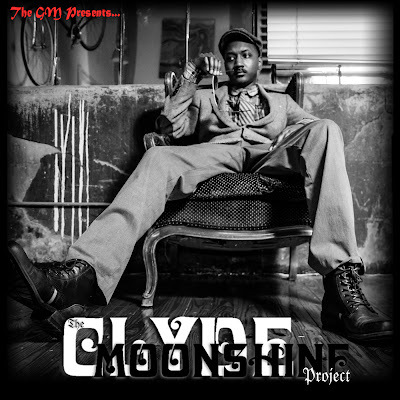 This is Clyde... Clyde Moonshine. He makes music. The CD might be something like the music you would expect a Marvin Gaye, Andre 3000 and Rick James collaboration to sound like in this new millenium. You should listen to the track below and purchase his project by clicking on the large photo at the bottom. If you like music, you might actually enjoy it.